San Francisco–based blogger Erik Ellestad has cracked the code on root beer. Here's the recipe. Erik Ellestad is a consummate tinkerer. The San Francisco–based blogger and cocktailian famously shook and stirred his way through all 750 recipes in bartender Harry Craddock’s 1930-vintage Savoy Cocktail Book. Ellestad chronicled his self-guided cocktail master class at Savoy Stomp, a site he continues to update with offbeat, beverage-centric projects. He’s created his own recipes for bitters, milk punches and more. This past summer, Ellestad set aside cocktails to explore another of America’s historic contributions to drinks culture: root beer. 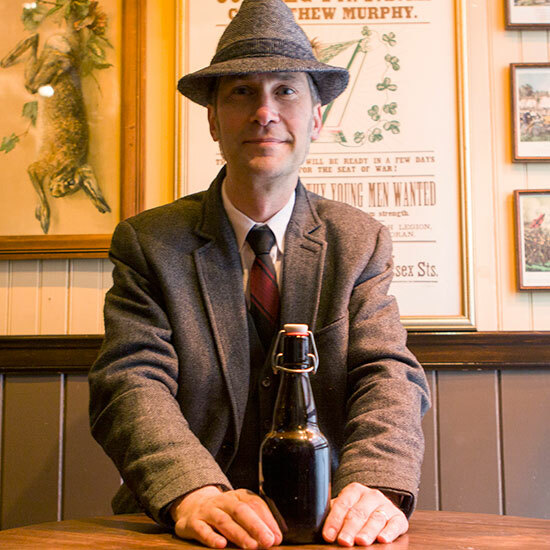 Over 20-plus entries spanning close to six months, Ellestad reviewed a slew of modern craft root beers while simultaneously delving into the, ahem, roots of this iconic soft drink, which was first popularized in the 19th century by a Philadelphia pharmacist, Charles Hires. Ellestad’s research not only led to some surprising discoveries, it laid the groundwork for him to create a recipe (below), which he believes closely emulates root beer’s original, bittersweet complexity. Why did you decide to make your own root beer? I was trying not to drink too much [alcohol] this summer, so I got interested in different soft drinks, like weird Italian sodas. A few people who I knew at restaurants in San Francisco were doing house root beers so I became curious. I started trying [commercial brands]. There was a great one from Oakland [California] called Wade’s. I think that Abita is good. Boylan’s, I liked a lot. But in general, I really can’t help myself from wanting to try to do something myself. I've made a lot of liqueurs and bitters over the years, but I’ve never made anything like a soft drink before. What did find out about early root beer? Root beer was originally sold as a kit. It was either sold as a powder or a syrup to housewives. You would carbonate it at home. You’d bottle it, put some baker’s yeast in it, and then let it carbonate in your basement. I thought that was really cool. And I guess that was also something that got me thinking, Why don’t I just do that myself? Most of the stuff in traditional root beers have some medicinal value, or were thought to have some. Ginger, people still take that for stomach upset. Wintergreen has an aspirin-like substance in it, so it’s kind of like an analgesic. It was also interesting that it had hops in it. I thought that was cool. What did you base your recipe on? An ingredient list from [commercial root beer pioneer] Charles Hires. I always stuck with the core ingredients—sassafras, wintergreen, ginger, licorice, sarsaparilla—and kept tweaking the recipe. The ones I like best are a little bit more bitter than most American soft drinks. Have you tried making cocktails with it? It is super-good with rye whiskey. Really, really good. Bring 2 cups of water to a boil. Add roots, cover and simmer on lowest setting for 20 minutes. Turn off heat and add herbs. Cover and steep for another 20 minutes. Strain out the solids. Stir in the sweeteners, cool and store in refrigerator. To serve, mix syrup with soda water to taste: 1 part syrup to 3 or 4 parts soda is a good starting point.